At DIYGateOpeners.com, we work by the philosophy: meet then exceed. When it comes to our prices we meet all other competitors on the web and back this up with a 110% price match guarantee. Then we exceed all others service by offering: 9AM-9PM 7 Day/Week technical support, enhanced warranties, application specialists to help design your system, free shipping on accessories with gate opener purchase, a large stock of 100% compatible accessories and openers, and much more. 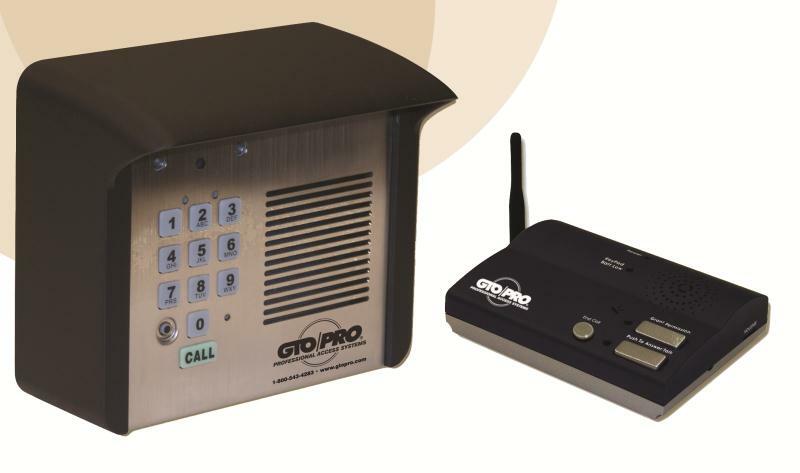 The GTO wireless intercom and keypad combination makes communication from the gate to the home a snap. The multiple base station capability allows the addition of three more base stations giving you a total of four. With a 500ft range you can talk to visitors out at the gate and allow access from within the home at the touch of a button and frequent visitors can just enter their code to gain access to the property. With a 25 code capacity you may give out may different codes controlling those who enter the property while being able to erase specific codes without disrupting the entry of others. When used wireless the keypad is powered by four C batteries. When used in hard-wired installations 8 to 24 volts DC can be used. Please see the GTO installation manual for more information on this model’s power specifications and requirements.